Red, aka RC's Red Teddy, is a 12-year-old red fawn male, born August 4, 1995. 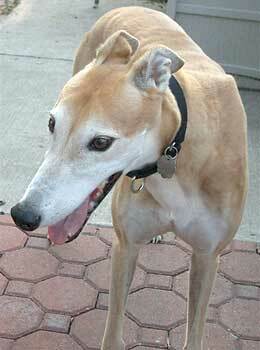 His sire is the famous Irish greyhound Tipp Ladd and his dam is Burn Off. Red's racing career was all at Southland Race Park in West Memphis, Arkansas, consisting of 80 races starting March 3, 1997 and ending July 21, 1998. His whereabouts these past 9 years are unknown at this time, as Red was found as a stray in the Mansfield area, weaving down a street with no identification. The Mansfield Animal Control did not think he would make it through the first night, but he did! Red arrived very frail and weak in his back end with multiple open wounds and swollen areas on each of his back legs. Dr. Jeff Ellis of VCA Preston Park Animal Hospital has been in charge of Red's care since his arrival. He has confirmed that Red has laryngeal paralysis; however, it is manageable at this time. You would not know he suffers from this unless he gets overheated or excited. The love that Red would bring into your home would far outweigh his special requirements. Red loves to be loved on (carefully) and is a sweet, sweet boy who is very easy to have around. He fits in well in a calm household and likes to be with his family and also spends time alone sleeping in a quiet place. It is not possible for Red to 'do' stairs and his forever home should not have small children. He is a perfect, gentle companion with lots of love to give. He is TOTALLY ready for his forever couch! Red is small animal and cat tolerant. Red was found as a stray in Mansfield over Father's Day weekend. He spent his first night at Preston Park, and since then has been with his foster family. When I picked him up from Preston Park that first night, he barely had enough energy to walk to the car and he could hardly stand. His right rear foot was so swollen, it was sweating. Dr. Ellis thought there was a chance it would abscess. His left rear knee was also extremely swollen. His shoulder had a huge gash and smaller sores were found all over his body. In addition, he was extremely thin and emaciated. The Mansfield shelter didn't think he would make it through his first night, but he fought through the pain. Red spent the first week with me sleeping most of the time. He was a tired boy from his journeys. For the first few days, he could barely gather enough energy to stand up to go outside. Nonetheless, he always would force himself to get up and he has never had an accident in the house. Thank goodness he had a good appetite, as he quickly put weight back on and gained his strength. He loved having me sit with him and love on him when he wasn't feeling well. However, he did not care for me cleaning his sores, although he will always lie patiently until I finish. What a special boy.... And how could such a sweet older guy end up alone as a stray?? It's now been a few weeks and I'm starting to see the real Red emerge. He has caught on very quickly to our routine. If it is meal time, he will look at me and let out a bark, as if to remind me. He stands at his spot, anxiously awaiting his meal and meds. I've been happy to see his spunky side starting to emerge. I learned the second weekend that he doesn't like sleeping in as late as my other greyhounds. I think the anticipation of his breakfast kept him from sleeping in too late. Since then, he is getting a little more used to the weekend schedule vs. weekday schedule. He knows that mommy and his greyhound siblings like to sleep in a little longer on Saturdays. Funny how they catch on. Red is a completely different dog from when he first came to me just a few weeks ago. Although he is an older boy with shaky hind legs, he sometimes forgets and just takes off running, only to find out his legs don't keep up with him completely. He doesn't mind...he is such a happy dogger. He loves playing with his stuffed animals – throwing them up in the air and running after them. 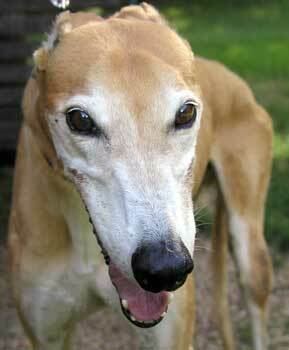 He also does the typical "greyhound bow" when he tries to instigate play from the other greyhounds. He is giving me all the signs that he is settling in nicely and is feeling much better than when he first arrived. Red is a very special boy. He doesn't realize he is an older guy...he has such a young spirit about him. When I look into his eyes, I see such a wonderful and loving soul. I see a sweet boy that still has so much love to give. Red's first foster mom described Red very well. He is a sweet, funny guy who can speak volumes with his eyes. He is a smart boy and quickly knows the routine of the house. Although, he does let you know very plainly when it is time to eat if you happen to be running a little late. He will come up to you and gaze into your eyes, then if you don't get up fast enough and move toward the kitchen, he will give a head bob from side-to-side (which is about the cutest thing ever). Now if that does not get you moving he gives a little bark and you just have to get up and feed him. Once you are getting the food ready, he stands by his bowl and waits patiently. He sleeps very well all night and will let you know if he ever has to go out in the middle of the night (which is very seldom). If you happen to be a light sleeper, you will first hear him bouncing around, if you don't get up after a few minutes, he will let out a bark. He has been sleeping in longer than I do or my other greys. He has not had one accident in our house. When he has to go potty he goes to the back door and stands and if you ask him "Do you need to go potty?" he starts bouncing (lifting his front feet off the ground at the same time over and over again) and bobbing his head while moving toward the door. This is a little scary sometimes as his rear-end is somewhat weak. He forgets he is an older gentleman and will run and bounce around like a spring chicken sometimes. TOO CUTE!! He is not crated during the day while we are gone, he does not mind being crated, but it is just not necessary. He tries to get our other greyhounds to play with him by going up to them and doing the play-bow. He is usually disappointed as they just look at him like "Ya, right!!" We do not take him for walks as he is pretty tired after just going outside to go potty and walk around the yard a bit. Red has some special requirements. Because he has laryngeal paralysis he does very well in a house that is kept between about 70 to 73 degrees at all times. If it gets much warmer than that he has difficulty breathing and he gets very raspy. Also, he cannot be outside very long for the same reason. So he goes out to go potty and comes right back in. 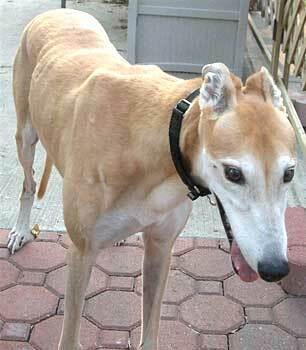 He would not do well going for walks with his laryngeal paralysis and also his rear legs being wobbly. He does very well on the food he is eating and he seems to like it, so it would not be good to try to switch him to a different food for any reason. The love that Red would bring into your home would far outweigh his special requirements. Red loves to be loved on and is a sweet, sweet boy who is very easy to have around. He fits in with whatever is going on and just wants to be part of the family. He is pretty much a perfect house quest with lots of love to give.